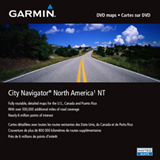 Garmin City Navigator North Am.. Product weight is 0.13 lbs. 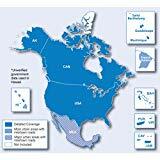 I purchased this item from "Navitech" since it has the lowest price. When I received the product, on the front sticker it shows "2011" and at the back of the package it shows copyright with year 2010. That might mean the product I received is containing year 2011 map data which was made in year 2010. On Garmin's own store, it is selling same product with map data version 2013.20. So make sure you're aware of the version number. M. Yang (Diamond Bar, CA..